Hospital bosses in Peterborough say they could lose around a million pounds a year following a MOD decision to close its medical unit. An RAF reconnaissance aircraft from Norfolk has captured aerial images of the floods in the Thames Valley. The deployment of the Tornado GR4 from RAF Marham has produced detailed imagery which it is hoped will assist the planning and co-ordination of relief efforts. 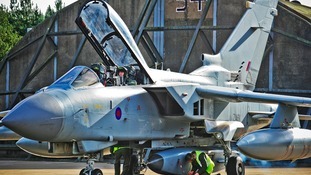 The aircraft, operated by 31 Squadron, is equipped with the highly versatile Raptor - Reconnaissance Air Pod for Tornado - which enables it to gather sophisticated, high-resolution imagery. The family of an airman killed in a collision outside Newmarket in Suffolk have paid tribute to him. Staff Sgt Anderson Johnson was stationed at RAF Mildenhall with the 100th Civil Engineer Squadron. The 24-year-old from Texas was killed when his car crashed into a tree at about 2am on July 28. In a statement his family said he had a smile "like the sun". They said "his laughter was contagious and his cheek bones reached the clouds... He was a wonderful husband, son, brother, family member... We want to thank all of you for taking care of him and loving him while he was with you." Johnson is survived by his wife, Markeah Johnson, his parents, Anderson Johnson III and Margarita Tedder, and his siblings Tashica Johnson and Dominque Tedder. The RAF search and rescue helicopters flying out of Wattisham airfield in Suffolk have helped to save countless lives. But from 2015 they will be no more. Instead a private firm will operate the service and the nearest base will be Kent. The Government's signed a £1.6 billion deal, ending 70 years of search and rescue run by the RAF and Royal Navy and has handed the contract to the US based Bristow Group. 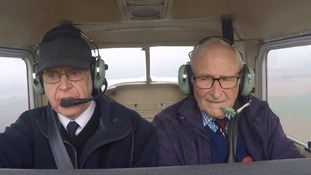 But as the coastguard stations at Great Yarmouth in Norfolk and Walton on the Naze in Essex both prepare for closure, there are concerns the move to relocate air support could leave our coastline vulnerable. Transport minister Stephen Hammond has defended the Government's decision to privatise search and rescue operations currently carried out by the RAF. A secret underground military base which has now been decommissioned has been put up for sale on the auction site Ebay. ITV Anglia's Laura Jones reports.